PAX was exhausting. It was an expensive trip to learn that I’m a small fish in a big pond. On the bright side, I’m more motivated than ever to make a name for myself in this unforgiving industry. But before we get into that…. What is this PAX thing you speak of? Ok, let’s start with the basics. PAX — Penny Arcade Expo — is one of the largest consumer facing video game expos in the world. It’s where gamers go to play the latest and greatest games. There are 4 PAX Events throughout the US and Australia. PAX East is held in Boston. This differs from E3 — Electronic Entertainment Expo — which is mainly for video game press, GDC — Game Developers Conference — which is for people making games and Comic-Con which includes more geek culture than just video games. At PAX, companies set up booths for gamers to play games at, people give talks about gaming, and cosplayers entertain everyone by dressing up. I have been to PAX West in Seattle 8 times. Every single time I went as a gamer looking at all the cool games. Most of those times I didn’t even know how to code. My favorite was always the indie game section. Indie meaning independent, generally smaller, video game making studios. Indies are known to have the most innovative games. Creativity and the love of the craft trump the business’ bottom line. The cool part about these booths is that the creator of the game is likely watching you play and open to conversation. The AAA titles, like Call of Duty, Zelda, and Final Fantasy, interest me less. Not only could you stand in line for 1–4 hours, but you are alone while playing, unable to ask questions about the development process. Fast forward to PAX East 2018 in Boston and I am holding my first ever Exhibitor badge! Something I have dreamed about for a long time. Walking around the crowd of 80,000 with this special badge gave me a sense of pride that I was invited because I created something. The Main Event — So what did I actually do for 4 whole days?? I had my own booth, a 3' diameter table to be exact, in which to display my game. I was with 5 other developers sharing a larger space. I had a monitor, raised above peoples heads, showing gameplay footage of Bunny Blocker. 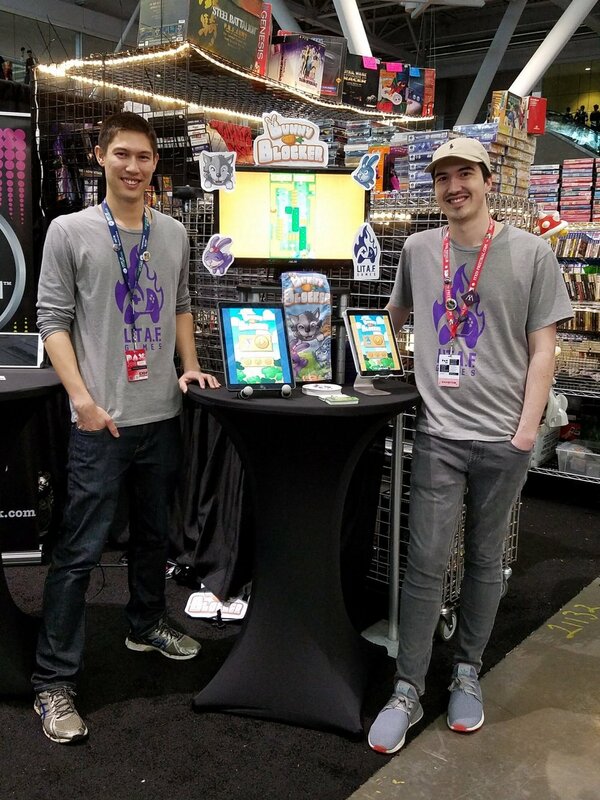 I had 2 iPads mounted on stands for people to play the game. There were business cards, stickers, and cozies that people could take after playing the game. Getting people to play the game was not too difficult. Tons of people would watch the gameplay on the monitor for a few seconds and then go up to an iPad and start playing. Some people really just want to play, while others wanted to ask me questions. I was with my friend Cameron, who did the music for the game, so we were able to switch off holding down the booth while the other got food, walked around, etc. So what did I get out of it? The overall response to the game was extremely positive! Many people were shocked that I did all the design and programming by myself in only 9 months. Some people congratulated me and shook my hand and I even had someone ask for my autograph. One of the things I didn’t anticipate was how well I would fit in with the rest of the people in the industry. I was talking the same talk and showing an impressive game. It reinforced my thoughts on choosing to go down this path since I had spent most of the past couple years coding alone in my apartment. More networking — not that I didn’t do a lot, but because I can always do more! This was not a press centered event, so maybe I was just expecting too much. I don’t think I will be featured on any major websites nor will any famous youtubers be playing my game. However, the few members of the press I did talk to genuinely enjoyed the game and put a small write up or image on their indie game focused website. I think one of the biggest takeaways was from something that happened on Saturday. I was walking around the expo hall looking at games and thinking, damn, all of these games are way too good. Their teams are bigger, they have better presentation, and they are doing things I don’t know how to do. It was getting me down. In that moment, I thought that maybe I wasn’t cut out for this. Later that night, my cousin Jacob said something to me. I had told him about all the other games that were there. The really, really good games. Before I could get to my negative reaction, he said something like, “are you motivated by that?” In my head the answer was no, I wasn’t. I was sleep deprived, hungover, tired, and part of me wanted to give up. But when he said that, I realized the mistakes I was telling myself. My exhausted mind was convincing me that it was too much and that I couldn’t do it. In that moment, I shifted my mindset from “I can’t” to “I can”. It’s ok that I don’t know how to do everything right now because I can learn. It’s ok that my presentation isn’t the best right now because it can get better. The fact that I was at that event, at my age, with a high quality product of my own is an incredible feat. I can figure out how to improve. I can always get better. Sometimes you look at something and think, I have no idea how they did that or wow I could never be that good. I now look at the other games and think, I can do that, I can be that good. And if I don’t know how, I’ll figure it out. That’s enough about my deeper motivational aspirations. For more on that, check out this blog post. If you’d like to learn more about my current project, check out Bunny Blocker. I also have a website with all the Lit A.F. Games projects.